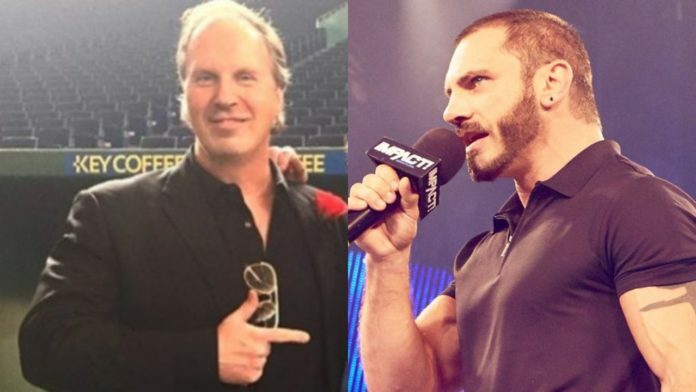 Don Callis addressed the Austin Aries-Johnny Impact situation from Bound For Glory recently on his podcast. Callis wouldn’t address Aries’ post-match antics but he did address the events leading to the PPV. Callis’ comments convey that neither the Tweets between Aries and Johnny nor the pull apart during the press conference was planned. While he didn’t say so specifically, it’s assumed he would have said the same thing about Aries no-selling and flipping him off at the end of the show. As for how Johnny Impact performed in the match, Callis offered up a lot of praise. Callis continued to say one of his favorite matches was the Knockouts title bout between Taya Valkyrie and Tessa Blanchard. Based on Taya’s comments on Impact last week, we could get a rematch between the two in the not too distant future. He also said the tapings in New York was a breakout moment for Killer Kross. Brian Cage was also mentioned as someone fans are giving a rockstar reaction to wherever they go. Just days before Bound For Glory, Aries was on Chris Jericho’s podcast and stated he’s never been happier than he has been with Impact Wrestling. Then at the PPV he is evidently so upset with management that he no-sells the finish, flips off Don Callis, and leaves. He was not at the following set of television tapings over the next two days either.